I’m four books away from the ending of my Nevada Barr Anna Pigeon Park Ranger Mystery tour. Whew. That’s a whole sentence and a half. 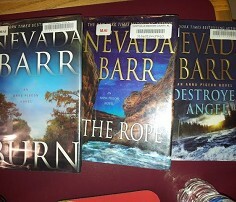 Anyway, this has been a fun spring/summer finding my joy of National Parks, strong female leads, and murder underneath the rugged atmospheric prose of Nevada Barr’s series. Nonetheless, out of 19 books, I have books 16-18 loaned from the library. Of course for pocket-friendly and conscientious reasons. And though I do have a tall mass market paperback of book #16, Burn, I prefer the ease and grace of swimming through Anna’s New Orleans adventure in hardback. I love tall mass markets, but hardbacks are always more comfortable. Or is it just me? Anyway, Anna Pigeon fans understand the enthusiasm. For those not familiar with the series, let me just crash course you on what each of these books are about to potentially whet your appetite. Burn has park ranger, Anna Pigeon, on administrative leave. She’s just survived the snow-filled isolated murders on Isle Royale (#14 Winter Study), and the equally troubling deaths in Big Bend National Park (#15, Borderline). As always, she’s beat up to boot. So Anna carries herself to New Orleans to stay with an old friend from the Park Service named Geneva. Yet, as mystery novels go, Anna finds herself in New Orleans Jazz National Historic Park hit by hoodoo and unraveling a string of strange occurrences in New Orleans streets. I’m interested in this one for obvious reasons. But it’s been a minute since Anna sort of stepped into environments centered in an urban setting, as opposed to the full-blown wilderness. Last time Barr took Anna into parks centered in a big city was book #7's Liberty Falling. Coincidentally, one of my top 5 favorites of hers. I don't want to say my exceptions are high–but dammit they are. Plus, New Orleans makes a cool exchange. I’ve read pieces of reviews and thoughts on Anna’s 17th adventure, The Rope. One lady I spoke with flat-out told me she didn’t like it. And, interestingly enough, Barr herself said The Rope was supposed to be Anna’s last book. That’s right, she was about to tie the series up. From what I understand Barr started another book with another cast of characters and focus. She kind of fumbled disinterestedly through the writing, until she hit a wall vacant of female characters. Her editor told her to just write another Anna book; Barr has since written two more. Thank you, Jesus. Nonetheless, The Rope is interesting for a simple reason: Anna is trapped at the bottom of a dry natural well naked and without any memory as to how she got there. All I hear in its premise is character study. Readers will only have Anna’s thoughts, memories, and undeniable will to survive to push the book. Almost forgot to mention the park Anna visits is Glen Canyon National Recreational Area. As for book #18, Destroyer Angel, I read it’s a madcap thrill ride revolving around a team of women snuffing out a team of men. Or to be precise, armed thugs. The murder and mayhem takes place in the Iron Range in upstate Minnesota. The Super Anna seen in High Country and Winter Study will most likely make an appearance. And with two days before either rescue or death, I can’t wait to see how Barr is going to settle this bloody chaos. While I always wonder how much more abuse Anna can take book after book, I generally don't care as long as she comes back to win again. Anyway, that’s it. God willing I’ll find a copy of Pigeon #19, Boar Island, lying around somewhere to wrap up this tour. If you’ve read any Anna Pigeon books and would like to express your love, please share them in the comments below.